← 261 "Day of the Jackanapes"
The family (dressed in prison clothes) are being chashed by police searchlights as they tunnel to the couch and sit as normal. "I will not buy a presidential pardon"
"New Kids on the Blecch" is the fourteenth episode of Season 12. It first aired on February 25, 2001. The episode was written by Tim Long and directed by Steven Dean Moore. 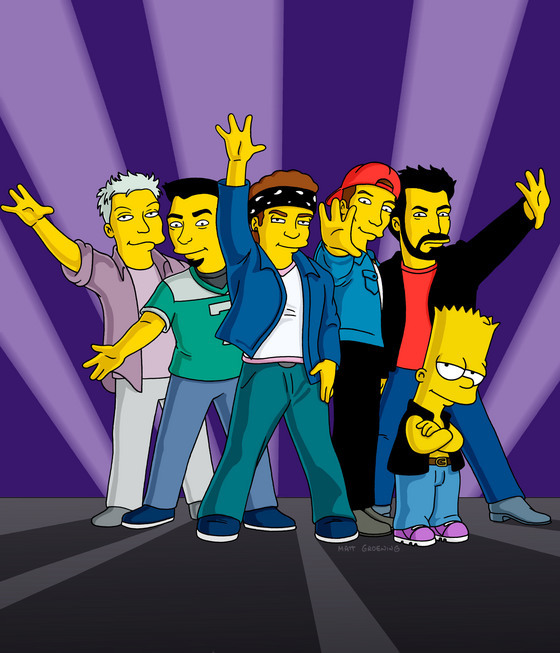 'N Sync guest star as themselves. "When a talent agency discovers the musical abilities of Bart, Nelson, Milhouse and Ralph, it scurries to set them up as the next big boy band sensation, complete with a sinister subliminal propaganda campaign in mind: "Join the Navy"." Homer Simpson joins the Springfield Marathon,along with other Springfieldians, including Mr. Burns and Smithers and Comic Book Guy (dressed as The Flash). By paralleling Rosie Ruiz's cheating in the 1980 Boston Marathon, Bart wins the Springfield's equivalent. When it is discovered Bart cheated, he finds himself in hot water with fellow competitors and spectators, so he accepts a stranger's offer to help him escape. The stranger reveals that his identity is L.T. Smash. L.T. 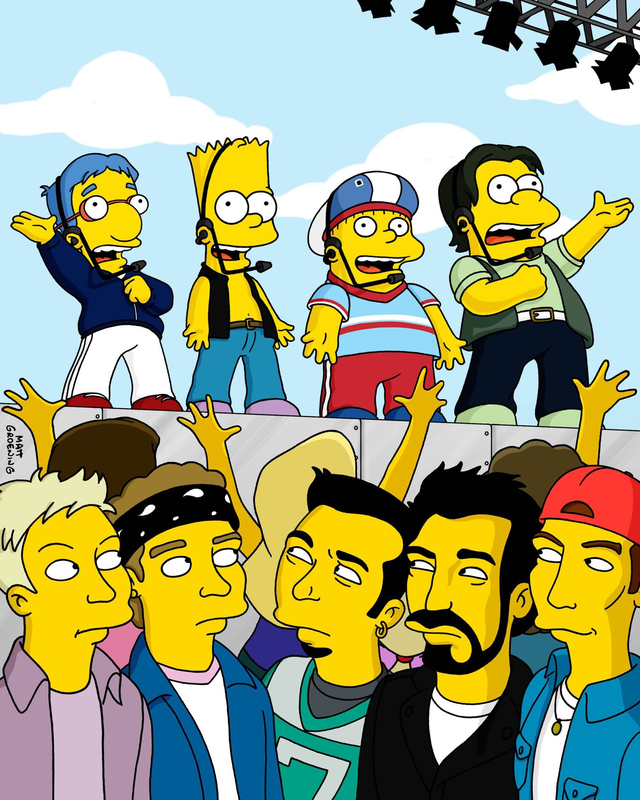 offers Bart a job in a boy band known as "Party Posse". Bart accepts, and becomes Party Posse's 4th member, Caly, joining Krit (Nelson Muntz), P.G. (Ralph Wiggum), and Wowz (Milhouse Van Houten),boys from Bart's school. Party Posse quickly ascend to stardom, albeit using complex voice enhancers built by NASA. No one is aware of the voice enhancer's use, and as such Party Posse's success depends on the voice enhancer. The band releases a single titled Drop Da Bomb, which contains a suspicious lyric; Yvan Eht Nioj. Lisa's growing suspicion around Party Posse, eventually results in her discovering the line is a subliminal recruiting message to join the Navy, as Yvan Eht Nioj is Join the Navy written backwards. Lisa also discovers that L.T. Smash is, in reality, a lieutenant (named Lieutenant L. T. Smash, on the sign the second "." of L.T. is covered up), who is working for the government to recruit people for the navy. Lisa points out her discoveries to Homer and Marge, but they dismiss her accusations as jealousy to Bart. The events come to a head when Party Posse perform a concert on an aircraft carrier, which only increases Lisa's suspicion towards the band. During the first song (which also contains subliminal messages about love in the Navy. ), L.T. learns from his superior officer that MAD Magazine's next issue will reveal Party Posse's secrets to the public.That means they will no longer recruit all of Springfield with Easter eggs,hidden and subliminal messages. Concerned the magazine will end Project Boy Band, L.T. 's superior officer shuts off the band's voice enhancer, exposing the groups's mediocre voices. LT. becomes increasingly aggravated about his Superior Officers's actions, and threatens to send the carrier out to sea. When L.T. completes his threat, a terrified audience,Marge,Lisa and Maggie evacuate the carrier. With only Party Posse, L.T., and Homer on the ship (Homer was unfortunately in the toilet at the time), L.T. sends the ship to New York City in an attempt to attack MAD. Despite 'N Sync's attempt to stop L.T., he destroys the MAD building with the ship's missiles, but L.T. 's actions appear to only reinvigorate the MAD workers. After L.T. 's criminal actions, he is arrested, and the potential of the fraudulent Party Posse remains unfulfilled,therefore ending their musical career to superstardom and returning to their old ways. Modified on July 15, 2017, at 07:00.